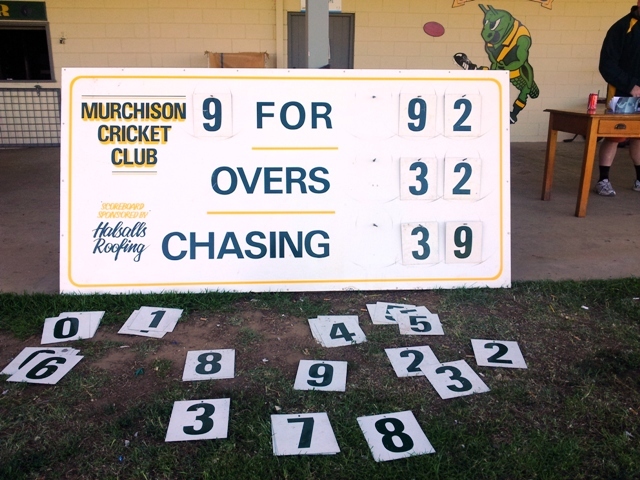 There are two footy scoreboards at my home club, Murchison, home of the Mighty Grasshoppers since 1881. 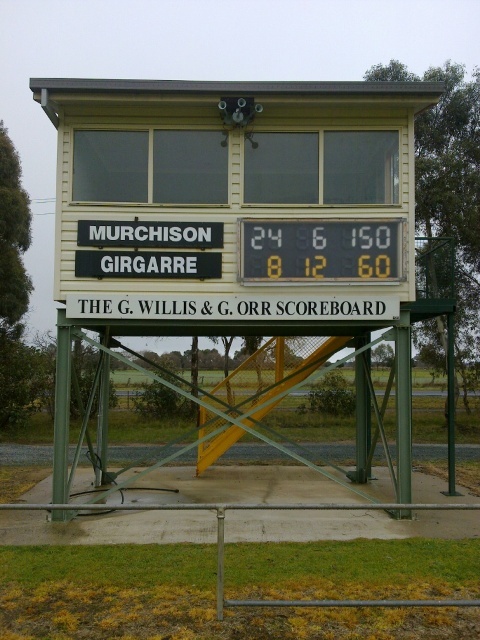 The modern scoreboard (with the digital looking but manual numbers) is named after two men who have been both tinmkeepers and scoreboard operators at the club for decades, Georgie Willis and Graham Orr. Georgie and Grazer are club legends who have done this lonely and thankless task for years, earning well deserved life memberships along the way. Georgie has taken a back seat in recent years, owing to ill health and Graham has taken over the timekeeping role in recent times, with my good self doing the duty of interchange steward and scoreboard operator. The numbers that we first had for the new scoreboard were way too small and weren’t visible to most spectators. After a lot of complaining (by me mainly), I got the club to ditch the tin numbers for the digital looking ones, and although they took a lot of getting used to (you have to do the numbers back to front and upside down in the booth before you shut the ledge), they are 1000% better for both players and spectators alike. The old scoreboard is still used from time to time, for finals – if we can find someone to sit up there all day. 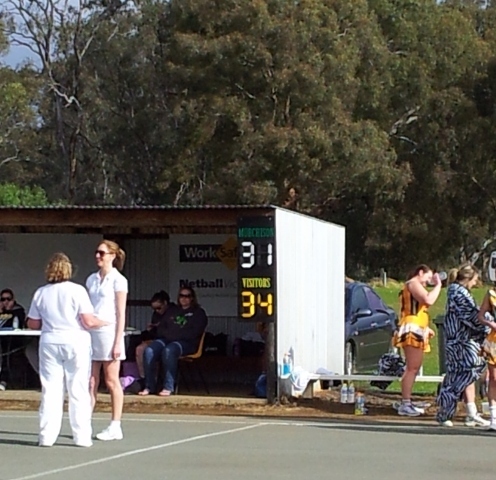 This is the Murchison Netball Club’s new scoreboard in a game against Tallygaroopna this year. It replaced an old scoreboard that was wooden with metal flip down numbers that was cumbersome and hard to read. The contrast of the names and the numbers work well. It’s lightweight and can be easily stored away. It was made by volunteer labour at the club, and it looks great. Murchison has fielded netball teams as part of the Kyabram District Football and Netball League since 1979. This year after, several heartbreaking losses in Grand Finals, the netballers won the their maiden premiership, in C-grade. Success has not been a regular visitor for the Grasshoppers, but this new netball scoreboard and a new court, will see Murchison claim more titles in the future. This was our first win in the Shepparton Cricket Association for our seconds, after many years in the Kyabram DCA. We defeated Invergordon on Saturday 10 November. 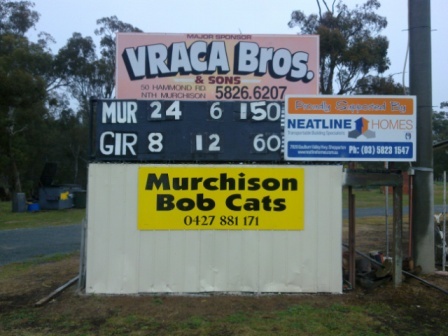 At Murchison we have a great ground and plenty of scoreboards, which should keep spectators up to date for years to come. Wayde Petersen is a green and gold Grasshopper through and through. He is Scoreboard Pressure’s newly-appointed Goulburn Valley correspondent. Welcome aboard, Wayde.